Pietro Mennea will be presenting his new book “L’ Oro di Mosca” (The Gold of Moscow) at the Scuola Pontificia Pio I X , located at Via dei Cavalieri del Santo Sepolcro in Rome on Tuesday April 27, 2010 at 5:30pm. Everyone is invited. The next time you get Lane 8 for the 200 meters, don’t complain! 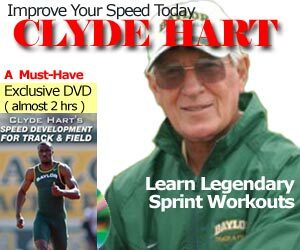 I wrote two previous posts on getting Lane 8 for the 200m: Xavier “X-Man” Carter’s 19.63 beating Tyson Gay in Lausanne in 2006 and Michael Johnson winning the USA 1992 Olympic Trials. Lane 1 through Lane 8 are all exactly 200 meters. 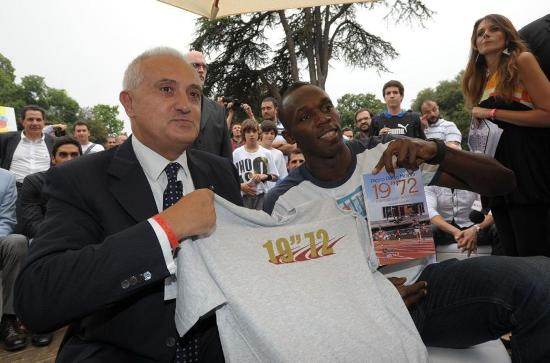 Pietro Mennea’s 19.72 200 meter performance set at the 1979 World University Games in Mexico City was the new world record which would become the holy grail of the 200m until MJ broke it 1996. Mike Marsh came ever so close in 1992 semi-finals. Mennea also won the Bronze medal at 1972 Munich Olympics at the same distance. Below is rare footage from the 1980 Olympics. Heck, any footage from those (boycotted) games are rare! The Dailymotion video below has great English commentary. Alan Wells won the 100m earlier at the Games, and for the 200 meters, Mennea drew Lane 8 with Wells right behind in Lane 7. Of course, the boycott prevented the Americans from competing. Take a look at how Wells gets into the blocks… not the traditional bending over crawling backwards and kicking the loose legs. As expected, Wells burns the turn but ties up just slightly over the last 20 meters. Mennea’s race calculation and energy distribution were perfect.. enough for a Gold medal! Talk about speed endurance!